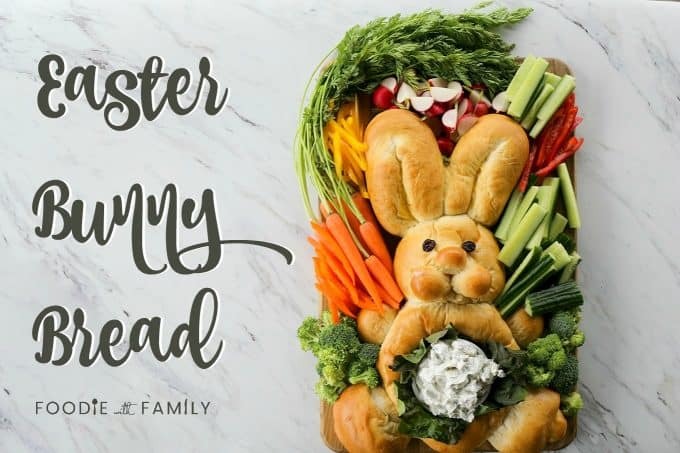 Easter Bunny Bread is a longstanding tradition in our family and my kids look forward to it even more than their Easter baskets! You can make it with frozen bread dough or with any homemade sandwich or shapeable bread dough. My sesame semolina bread dough makes a lovely Easter Bunny Bread. Visit our Bread Recipes page for more fantastic homemade breads! I’ve been making Easter Bunny Bread since my eldest was a bonnie wee boy in diapers. And seeing as he is now a legal adult and three of his four of his brothers are now full-fledged, card-carrying, certified (and certifiable) teenagers -pardon me while I go hyperventilate for a couple minutes- I think you could call this a truly ingrained holiday tradition. The boys wake up early. The Evil Genius and I lay down the law about only eating two pieces of candy from their basket, look the other way and drink something highly caffeinated while they eat six, make a protein heavy breakfast to offset the sugar, hose them all off (or run them through the shower), tell them to get dressed (and pray no one gets to church shoeless like they did that one year…), load up in the van, attend church, return home, take off church clothes, put on our fat pants and lay into the annual bunny bread with wild abandon. Please pardon my run-on sentence. Which is better than a fragment. Oh dear. That bunny doesn’t stand a chance against this ravening horde. And this is the honest reality of it; My kids look forward to the Bunny Bread more than they do their Easter Baskets. ‘Round here, this is a strictly Easter dish, but I can see this going over a treat at a bunny-loving child’s birthday party or a get together for friends.You don’t have to be a bunny-bread withholder like I am. Feel free to bust out Bugs whenever the muse strikes. Don’t let the idea of shaping bread scare you away. This is quite simple. While I start with approximately two pounds of homemade bread dough (I recommend this recipe!) you can your favorite standard bread dough or even thawed frozen bread dough. It’s just a matter of breaking it down into steps, and I’ve done that for you. To see just how easy it is, watch the video at the top of this post. You can use homemade bread dough like this, or use purchased frozen bread dough that you’ve thawed according to package instructions. Either will be delicious. My preference is for this semolina dough. As for the dip, put whichever one best floats your boat. I love this one the best, but use whichever dip makes your family happy. When it comes time to assemble the Easter Bunny Bread, use a small ramekin for the dip. Invert it on top of your bunny bread and slice around it. You don’t need to slice deeply, just enough to let you know the outline of the bowl. You can then use your hands to pull the circle out that you sliced and the bread underneath it to make room for the lettuce and bowl. Feel free to eat the bread you pulled out ~or~ cube it and serve it alongside the Easter Bunny Bread. As far as lettuce goes, I find red or green leaf lettuce or butter lettuce to be the best options for lining the bunny bread’s tummy before adding the ramekin. Those three lettuces have a fresh, green, leafy look. A crunchier lettuce -like iceberg and romaine- will not be quite as nicely ruffled and will be prone to breaking. When it comes to vegetables, add whatever makes you hop with joy. Carrots are a natural choice, but we like to add a large variety; a little something for everyone like cucumbers, broccoli florets, bell peppers, cauliflower, radishes, snow or sugar pea pods, and more. Look how easy it is to make Easter Bunny Bread! Do you love this Bunny Bread? Check out these other wonderful treats for Easter! Cut your ball of dough into two pieces that are approximately 1 pound each. Cut about 1/4 off of the remaining hunk of dough. Roll the piece into a ball and then flatten slightly on a parchment or silpat lined cookie sheet to form the bunny's head. Roll the other 3/4 of the dough piece into a ball and flatten into a large oval that is about 6-inches across. This will be the bunny's body. Place the body directly below (and in contact with) the head on the cookie sheet. Cut the second dough ball into four equally sized pieces and roll into balls. Roll two of the pieces into long, snaky ropes (about 15 or so inches long) and then fold the ropes in half. Place on either side of the head as ears and tuck the ends slightly under the head. Take a third dough ball, split into two equally sized pieces and roll into balls. Position one ball on either side of the base of the bunny's body like back paws. Use a bench knife or butter knife to cut two slits at the outside edges of the back paws to form bunny toes. What? They have toes. Divide the last remaining portion of bread into 3 equally sized pieces. Roll two of the pieces into balls and place against either side of the upper third of the bunny's body to serve as front paws. Take the remaining dough and cut off 1/4 of the dough. Roll the tiny piece into a ball and position on the bunny's head to serve as the nose. Cut the final piece of dough into two equal pieces. Roll those pieces into balls and position under the nose for the bunny's cheeks. Remove plastic wrap, brush lightly with beaten egg and push the two pieces of dried fruit into the bunny's head for it's eyes. Bake for about 30 minutes, or until the bunny is golden brown and lovely. Let rest on the pan for 10 minutes before transferring to a cooling rack to cool completely. Transfer the cooled bunny bread to a serving platter. Cut a hole equal to the size of the bowl you will use for your dip from the belly of the bunny. 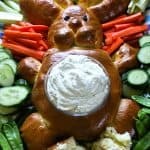 Set the bowl of dip down into the bunny bread. 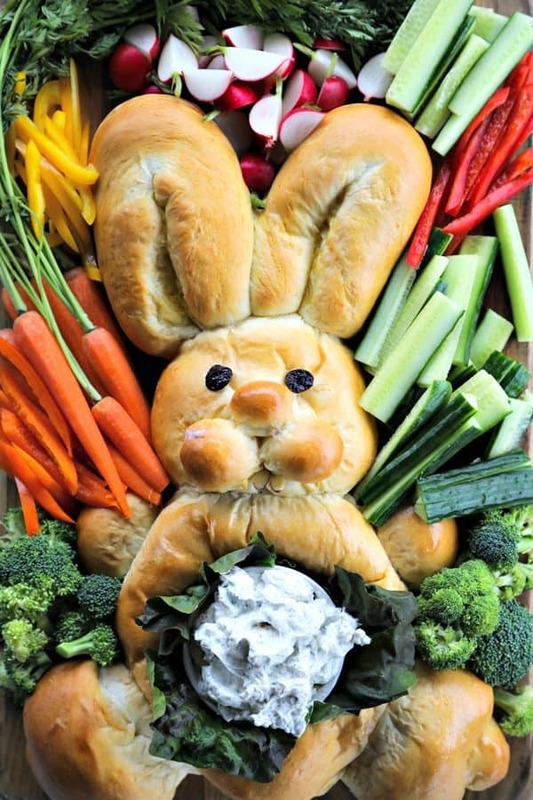 Arrange vegetable sticks and crudites around the bunny and serve! You can, alternatively, line the hole in the bunny's belly with lettuce leaves and put the dip directly into it. We prefer to put the bowl of dip in to better salvage any leftover dip after we devour the bread. This would also be preferable if you think you may have leftover bread. Originally posted April 22, 2011, Text, photos, and tutorial video updated March 2017 and 2018. Now, you know I ain’t makin’ this for just the two of us, but anyone considering it? Listen to the bread queen: do not fear shaping the dough. Shaping risen bread dough is a cinch. And the hilarity of this on your table would be SO. WORTH IT. This is GREAT! I wanted to do something special with bread this year. Thanks for the GREAT idea!! Honest and for true…hmmm. Was it Bugs Bunny? Well, ya know, Melissa… You could halve the recipe… Or halve the bunny, which would lend a whole new hilarity to it. And if you do the bowl of dip, you could freeze leftover bread. Peer pressure. Peer pressure. Peer pressure. Stef- You’re MORE than welcome!! Yasmin- You are officially extra super cool. At least to me and my kids. 🙂 It WAS Bugs. This looks less time consuming and just as cute as the honey bunnies I’ve made for Easter. I’ll have to try this one. This is an adorable tradition!!!! I’m de-lurking to say thanks for this recipe and post! I was really inspired by your tradition, and can’t wait to make this for my family, and establish our own tradition. Elise- Thank you for the heads-up. Did I fix it? Kathryn- Honey bunnies? Do tell! Karen- Have you tried Bob’s Red Mill Gluten-free all-purpose baking mix? My sister makes wonderful bread with it! Alice- I sure hope you get a chance and like it! Darling! Hoppy Easter to you & yours! This is pretty much the cutest thing I’ve ever seen! How cute! This bunny is what memories are made of. Your children will always remember their easter bunny. Oh my! This is so cute Rebecca – i’m sure everyone would go crazy for this! Thanks for this recipe. Do you make a single recipe of the linked to bread dough or a double? I appreciate your help, and look forward to making this. Hi Jancey- I use a single batch of the dough to which I linked! If you were to use 1 pound of dough to make a smaller bunny, are there any other changes you would make? Possibly to temperature or baking time? I have a smaller family, but I would still like to give this a whirl! I’d keep the same temperature, but start watching the bunny for doneness earlier. Just watch it as it bakes. When it looks like the bunny in the picture (golden brown and lovely), I’d pull it! HA! This is wonderful Well equal parts wonderful, funny, and bizarre. So. Friggin. Adorable! How fun would it be to share this at the family dinner! HA! Thanks, Marly! My kids look forward to this more than the candy in their baskets. Oh I love this! I 100% am making this!! Since there is only 2 of us this is acceptable dinner right?? I saw a rabbit with dip in Woman’s Day magazine. Ripped it out and darn if the recipe was not with it and I had thrown out the magazine. Thanks for yours. This is the cutest thing ever! Will defenitly be making this bread. Adorable. And those cheeks! Happy Easter! Do you let it rise before shaping it (per the instructions for the bread dough you linked) then let it rise again after shaping into a bunny? Wanting to try it but I’m a total bread baking novice. Thanks! I’m sorry it took so long to get back to you, I’ve been travelling. You are absolutely right on letting it rise per instructions and then let it rise again after shaping into a bunny! This is seriously the cutest thing ever. This is adorable!! You can fill with anything – sweet or savory for a dip! Thanks so much, Erin! You’re absolutely right! That is the best compliment ever! What a fun family tradition for Easter! This couldn’t be any cuter! And how awesome that your boys look forward to the tradition each year. Thanks so much! Even my 20 year old still loves the bunny bread! This is so absolutely adorable I can’t get over it! This is like, ridiculously cute! I would make the dang thing for its cuteness, even though I can’t eat it! This is absolutely adorable!!! Adding this to the Easter menu. Woohoo! I hope you all love it as much as we do! Your Easter routine sounds like fun! I love this bread, and my girls would love it if I made it for them.